This very popular multi-functional training lead for dogs is slightly thinner than the Large Halti Training Lead and is designed for the smaller dog. It is soft to the touch and lightweight, making it very comfortable to use for dog training or simply for taking your dog for a walk. You can easily adjust the length of the lead by clipping one end of it to three different rings on the lead giving you a short (1 meter) lead for normal walking, medium (1.4 meters) lead for obedience training and long (1.7 meters) dog lead for recall and distance training, all in one. You can also use this double ended lead and attach the clips at either end to 2 separate dogs or use with a harness such as the Perfect Fit Harness. 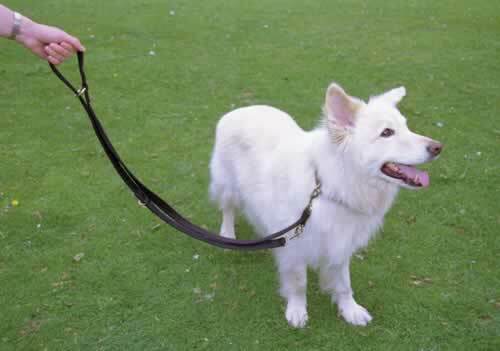 Can also be used for hands free walks by attaching the lead around your waist. 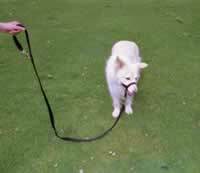 The Small Halti Training Lead is 1.5 cm's in width and made with soft, padded webbing for extra comfort. 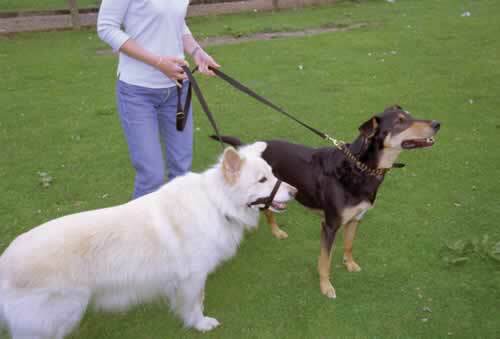 The Halti Training Lead is also available in a large size which is the same length, but a larger width.